PHPBB is one of the world’s best open source forum platform. I personally love using it on all my support forums as it’s really flexible and easy to customize. As I am web designer, I love to design websites and blogs. And consider the creativity phpbb gives you freedom to customize its template as per your need. Today you can easily find lots of premium phpbb templates on internet. Most of them are responsive and comes with free life time updates. This forum platform is developed completely on PHP which is also an open source programming language. Today PHP has became one of the world’s most favorite tool for developing dynamic websites and web applications. Actually all of my blogs run on WordPress which is also built on PHP. One of the biggest advantage of this language is that it’s easy to understand and can be optimized for corporate purpose. I means to say that e commerce websites like Amazon, eBay and many other are built completely on language. When I started my first forum I didn’t cared about mobile responsive design and speed. And due to this I lost around 100,000 visitors annually.Then I was recommended to used responsive phpbb themes by my members and after implementing it I saw sudden spike in my traffic. This happened because more and more visitors were coming from mobile devices and were joining on my forum. This was not just encouraging point for me but it also helped me to improve my revenue. If you want to have template built upon world’s famous front-end framework bootstrap 3, then wide is a perfect option for you. If you ask me, I just love its color combination and responsive layout. I mean just look at it’s design. It has such a great typography with retina icons. It even comes with powerful customizer which allows you to create unqiue styles. Just try to resize your browser and it will automatically change it’s width to fit the screen size. Finally when your browsers width comes close to 600px it’s navigation changes to drop-down menu.Wide also comes loaded with lots of advanced features like font loader. Now you might think what is font loader. Well, it’s just a simple thing which allows you to choose unlimited web-fonts from Google fonts directory. You can use these font on your forum with just a click of your mouse. Wide is even cross browser compatible. Please click here to check out wide. 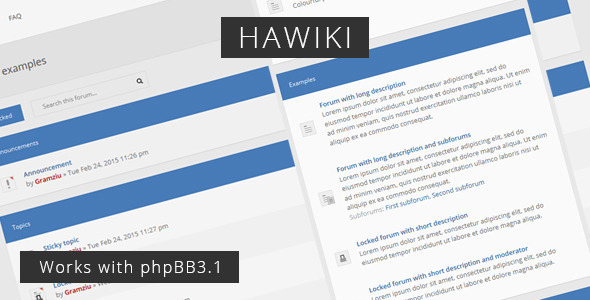 If you like flat design like me, then you will surely like hawiki template. It has got very simple, clean and responsive design which looks perfect on every device. I mean to say that it’s built on valid html5 and css3 and uses media query. Due to them hawiki is cross browser compatible. It’s even mobile friendly which means now your members can log into your website from their smart phones and tablets. Now please click over here if you wish to check this template live. If you want to move along with latest web design trend then I will suggest to take a look at this awesome theme. It’s called marina and is one of the top rated style on internet. 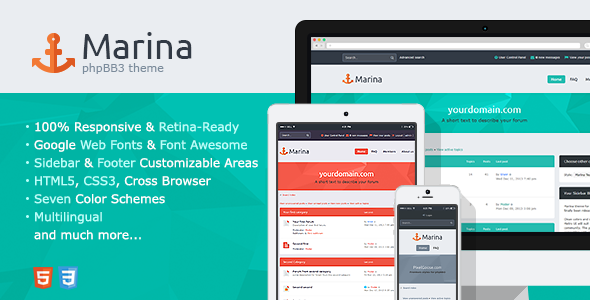 Marina looks simply gorgeous on every device, thanks to css3 media query. It even has support for multiple styles which helps you to choose a perfect design for your brand. Currently it comes pre packed with 7 color styles. Now let me first ask you a questions. Do you know about information blocks in phpbb. Well using these blocks you show your visitors latest news or updates. Now if you really like this theme then I will suggest you to check marina in your browser. One & the only phpbb theme with complete flat design I have ever used for phpbb. It is a flat, elegant , clean & responsive template that also comes with lot’s of key features to make your phpbb forum mufti-dimensional & powerful. The features includes full support with detailed documentation , life time free updates & dedicated support. A simple flat phpbb forum theme with validated HTML & CSS3 codes that ensures the cross browser compatibility for better user experience. Key feature Includes the synchronization of phpBB3.0.12 & phpBB3.1.3 , full documentation , fully responsive , 5 different theme color , retina ready and beautiful css animation effects. Now here comes the end to this phpbb forum collection. 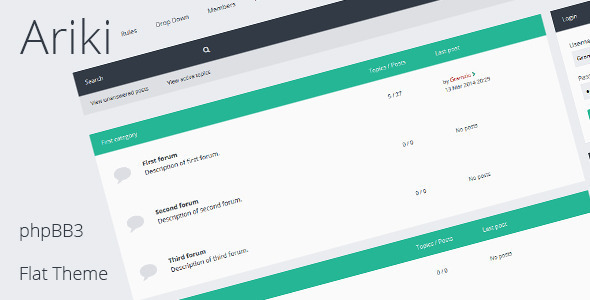 But I can assure you that this is the best forum theme in the marketplace now and also will update this post once I find any high quality new additions and also responsive phpBB forum templates. So , till then enjoy this themes for your forum & please don’t forget to share it .